PHOTO: Cancun Visitor and Convention Bureau. USA TODAY came up with these tips for enjoying your Cancun vacation while keeping within your budget. 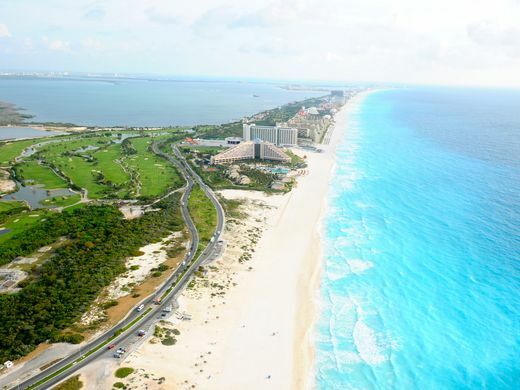 Cancun is geared toward tourism, and skews pricey. But whatever the reason for choosing Cancun – whether it’s a yen for the beach, to attend a destination wedding, or to explore Maya culture, let’s say Cancun is firmly on the vacation radar and making it an affordable travel experience is task number one. How would one do so? The good news is this is a very good time for travelers from the USA to visit Mexico, since the dollar is performing outrageously against the peso. What was just a few years ago 12 pesos to a dollar now has leaped to 18 pesos a dollar. Inflation will eventually catch up, but it hasn’t happened yet. While the U.S. dollar is accepted everywhere, travelers will find they can get a slightly better deal when they convert their dollars into pesos, probably saving the equivalent of roughly 4% on purchases. Another tip is to avoid exchanging money in a bank or hotel, and instead scout out a small exchange office, which will usually give a better rate. Also, as an expatriate resident of Mexico myself, it was a rude shock to see how expensive it can be to withdraw cash from a Mexico ATM. Sometimes you’ll get hit by two fees for one transaction, an ATM fee of up to $5, as well as a 2% fee on the amount of cash withdrawn. So if you’re on a budget, plan ahead and avoid ATMs. The exception to this is when a U.S. bank has an agreement with a Mexico bank to waive fees on ATM transactions. Some people might advise a traveler to choose a hotel in downtown Cancun, where they’ll find cheaper rates than at one of the resorts on the beach. But why come to Cancun if you’re looking for a Mexico urban travel experience? Cancun is all about the beach and the bling. If it’s a city experience a traveler wants, they’d be much better advised visiting Merida, a fascinating colonial city in the Yucatan. When traveling, it’s always a choice between saving time or spending more money. If time isn’t an issue, visitors can maximize their spending cash by taking the public bus, which drives back and forth along Cancun’s hotel zone. The city’s two bus lines are Turican and Autocar, which will also take travelers into downtown Cancun. Cancun garners a lot of attention for its high-end shopping venues featuring luxury brands like Cartier and Gucci. Save money by going to local crafts markets, where it’s perfectly acceptable to bargain. Shoot for reducing a price by 25% or more. If the seller meets your price, it’s good manners to complete the purchase. Another way to save is to travel during Cancun’s low season, which is late August through November. The downside is that this time period is also the region’s hurricane season. Resorts are competing with each other for business during the low season and often offer promotional packages. If a traveler is feeling particularly persuasive, they might even be able to negotiate further savings, depending on length of stay or number of people in the party. Prices spike during the peak season of mid-December through February, Easter week and late July through August, when domestic Mexican travel is at its peak. A good way to manage costs is to book a vacation in one of the more affordably priced all-inclusive hotels, such as the Now Jade Riviera Cancun, Iberostar Cancun, or Hotel Riu Cancun. An all-inclusive hotel means all meals, snacks, and drinks are included in the rate. There will also be no fee for non-motorized watersports, and evening entertainment. Since many all-inclusive resorts have a non-tipping policy, it’s conceivable for a traveler to spend a day on the beach or by the pool, eating and drinking as much as they want, and not once dipping into their pocket to pay for anything. However, I’ve found that even at non-tipping resorts, it’s still good practice to tip the staff. They’re not making a ton of money and your tip will get you friendlier and more attentive service throughout your stay. The downside of vacationing a full week at a budget all-inclusive is the sameness of the experience – for some travelers the buffet will begin to look a little tired and the resort over-familiar. It’s good to budget for off-resort splurges, whether it’s a night out at a gourmet restaurant or partying at a popular nightclub. Nearby attractions include the Maya ruins of Chichen-Itza and Tulum, Maya cenotes (freshwater lagoons), the intriguing Cancun Underwater Museum, or the Museo Maya de Cancun. Day trip options also include the nearby islands of Isla Mujeres or Isla Holbox, which provide a laid back change of pace. Another accommodation option is to book a condo or EP style hotel that have their own kitchens. By doing their own cooking and shopping in local markets, travelers can squeeze every last cent out of their vacation dollars. Cancun also has a public beach in the hotel zone, Playa Delfines, so it’s conceivable to have plenty of days on the beach without laying out the bucks.